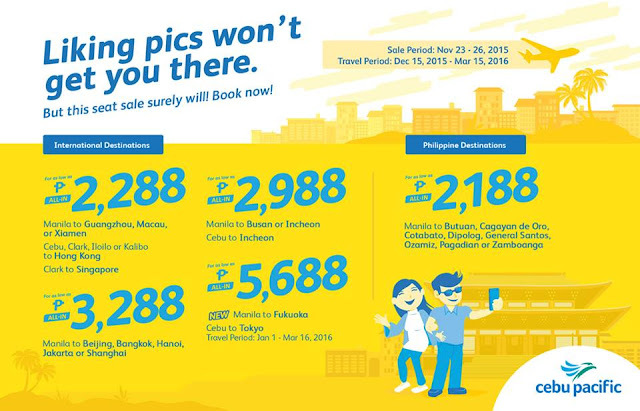 Piso Fare Promo 2016: While you are at your seat right now waiting for some Piso Fare from Cebu Pacific for 2016, you can take advantage of this latest promo now. Seriously, no Piso Fare for now. But here are some cheap fares that you can avail. Most of it are for International travel. Though, some Domestic routes are on sale but mostly to cities in Mindanao. What do you think? Quoted fares are valid for one-way travel only. Inclusive of 7 kg hand carry baggage allowance, base fare, web admin fee and all taxes collected at point-of-sale. Terminal fees for non-Manila/non-Cebu Stations and Php 1,620 International Travel Tax must be paid at the airport. Promo fares have limited availability and are non-refundable but rebookable subject to the following rebooking fees: Php 1,500 (domestic), Php 2,300 (short haul) and Php 2,800 (long haul) plus fare difference. For your convenience, flight changes, availing of prepaid baggage allowance for check-in baggage and self-check-in services can be done up to four hours before your scheduled flight. All ATR flights will be operated by Cebgo starting October 2015.